SharePoint Online migration - how to migrate SharePoint between tenants? SharePoint has become a platform for secure collaboration in many organizations all around the globe. Especially after the introduction of SharePoint Online. Because of this popularity, most companies have grown used to using SharePoint on a daily basis. As a side effect, the SharePoint site collections have been growing more and more ever since. SharePoint can handle tremendous data sizes, that is not the problem. The problem occurs when you need to migrate SharePoint. There is no automatic native path for this task – that is why admins learn to fear the phrase “SharePoint Online migration”. Let’s change that. Migrating SharePoint, no matter if it is migration between tenants, migrating from SharePoint on-premises to SharePoint Online, or even migration between site collections, does not have to be a manual nightmare. The solution might not be that obvious as it uses a third-party tool: CodeTwo Backup for Office 365. While CodeTwo Backup for Office 365 is primarily a backup and restore solution, it is quite versatile. It allows Office 365 organizations to back up and restore data residing in Exchange Online, SharePoint Online and One Drive for Business. Additionally, it can be used to archive data and migrate items. This article focuses on the last of these functionalities. Microsoft has released SharePoint Migration Tool. Currently, this migration tool supports only a single scenario – SharePoint 2013 (and on-premises file shares) to SharePoint Online. The tool is primarily an Exchange Online, SharePoint Online and OneDrive for Business backup and archiving solution. 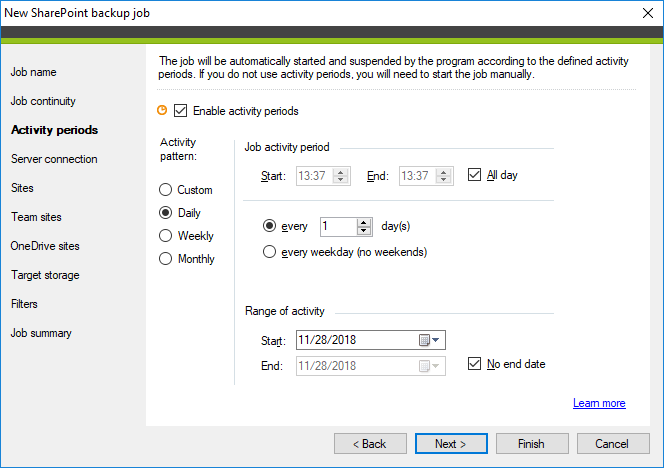 Thanks to that, if you use it for migration purposes, you can still use this tool, later on, to secure your Office 365 data to fill the gaps in any business continuity and disaster recovery plan. Migrating SharePoint data between Office 365 tenants is a common task, especially in the context of a merger or acquisition. The problem is – there is no way to perform such migration with the natively available tools. Still, “not natively available” does not mean “impossible”. You can either perform this task manually or with a third-party tool. 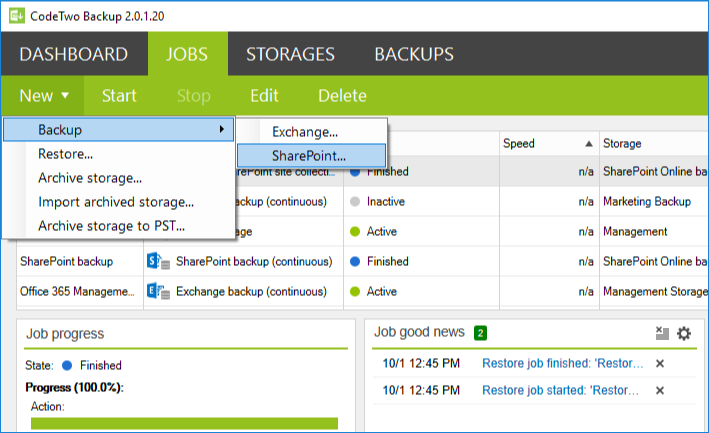 Clicking the Finish button creates the backup job and starts the first stage of the SharePoint Online migration process. 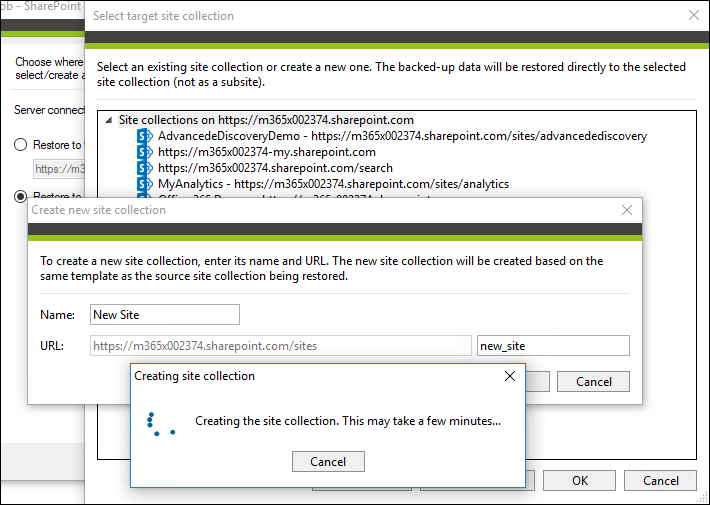 When the tool is done creating the backup, you can go to the Backup tab to access and search within your SharePoint data. Thanks to the permissions automapping feature, all permissions can be recreated in the target environment without any manual work from the administrator. Migrating SharePoint 2013 and SharePoint 2016 to Office 365 is just as easy as migrating SharePoint Online between tenants. You can easily recreate your on-premises SharePoint structure in SharePoint Online, migrating all kinds of item types and permissions to the resources. 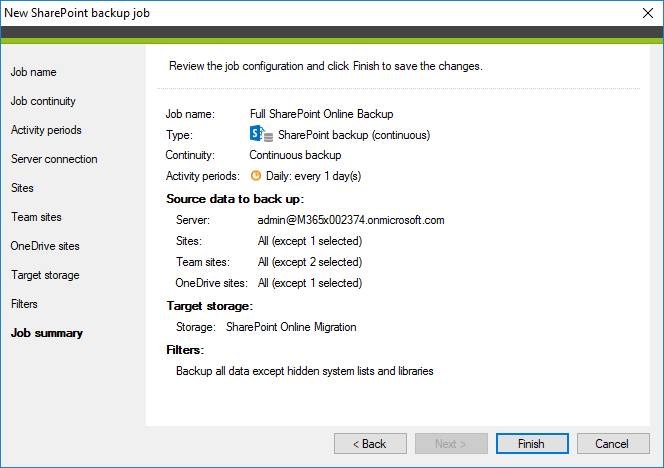 Learn more about SharePoint backup and restore jobs. SharePoint, above all, is a tool which supports and simplifies collaboration. It does its job very well, especially because of seamless integration with other Office 365 functions, such as Exchange Online, or Teams. However, SharePoint – while excelling as a platform for sharing multiple projects, somehow lacks in mobility. 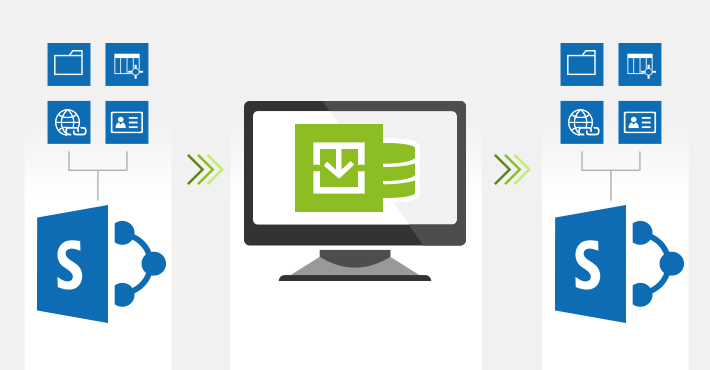 With the help of CodeTwo Backup for Office 365, you can migrate site collections much easier. 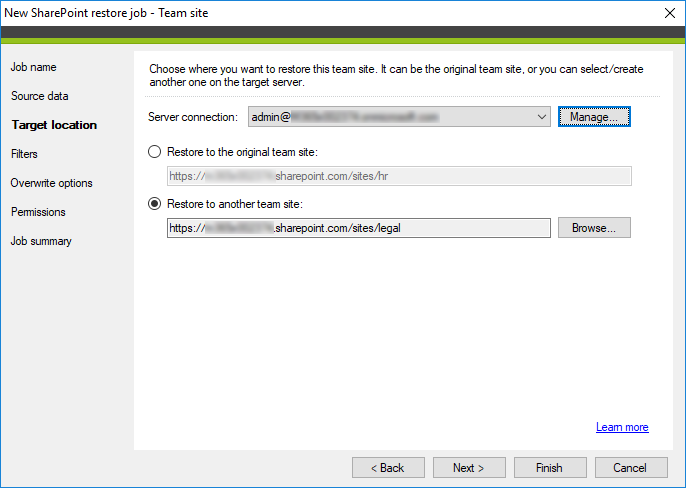 After you back up a certain site collection and start the new restore job, choose to create a new site collection in the source tenant or any other, target tenant. By using the tool’s mapping options, you can automatically recreate permissions users had in the source location. 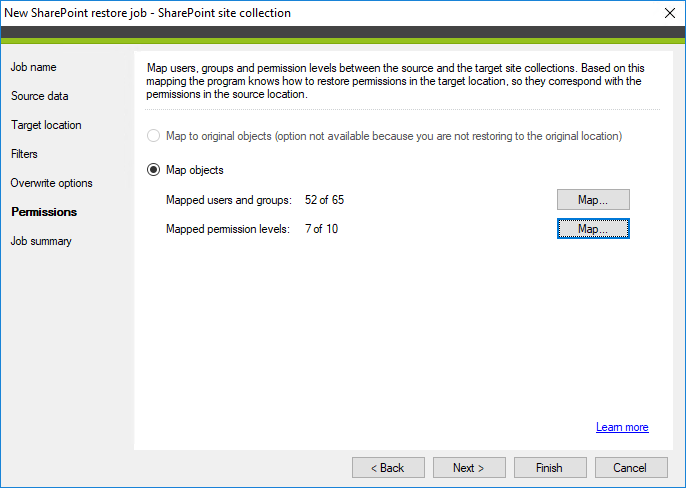 If you migrate site collections to another tenant, you can manually map permissions to target users and save the map to use for other site collection migrations. This complete Office 365 backup tool lets you secure your Exchange Online, SharePoint Online, OneDrive for Business and Teams data. Back up the data stored in the cloud to your local resources for full control over it, independently of cloud service availability. Then, search within the backup copies and restore data on any level of granularity to any target location. Watch the video below and see why it is important to secure your SharePoint data.